Do you want to see what’s going on behind the walls of your current home or above the ceilings in the home you’re thinking about buying? You might not think it’s possible to inspect these areas, but Mountaineer Inspection Services can do it with home infrared thermal imaging and energy auditing services in North Central WV. By using a thermal imaging camera, our experienced inspectors can take a closer look at a home and tell you more about it. There are a variety of things that Mountaineer Inspection Services can detect through the use of home infrared thermal imaging and energy audit services. For example, a thermal imaging camera can be used to spot water leaks located around windows and doors. It can also be used to check out roof vent piping, skylight leaks, and problems with your roof. 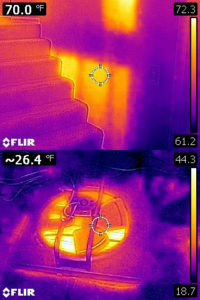 Additionally, you can use a thermal imaging camera to see whether or not the insulation in a home is doing its job. This comes in handy when assessing how energy efficient a home may be. You can even use a thermal imaging camera to check for plumbing leaks, improperly installed toilets and condensation on water pipes. There are so many potential problems that could be lurking behind the walls of your home. If you want to be sure these issues won’t affect you, Mountaineer Inspection Services can provide you with the infrared thermal imaging and energy audit services you need to rule them out. By utilizing a thermal imaging camera and other diagnostic equipment, we can literally inspect every square inch of a home and deliver a full report back to you. Our home inspectors are trained when it comes to using these thermal imaging cameras, and know how to utilize them properly for the best results. To learn more about the infrared thermal imaging services in WV offered by Mountaineer Inspection Services, get in touch with us at 304-709-3200 today. Click here to read our reviews.